departments but taste like one of Cody's dog chews. take up so much room, I was about to tell the neighbor, "no"
memory. OMG they ARE the wild strawberries of my past. I've been reliving an old movie all summer. I haven't had fresh strawberries in so so long. I cannot wait to have some again! When you do, I hope they are the really good organic, old fashion taste ones. ......and they were double mmmmm. Sounds like they are sure pure bliss for you. Never a fan of strawberries at my zoo. Only ever tried store bought ones once or twice though, I think. If you bought your berries in a store, then you too, know what dog chews taste like..... no flavor, tough and you really have to chew. The Alpine melt in your mouth and taste divine. Just wandered over from Cranky Old Man's blog. Love your blog. I'll be back. Thank you for stopping by. I stopped by your blog but as I said, google never allows me to use Manzanita so no one ever knows who I am. Yes, and wild strawberries beat out dog-chew grocery store berries hands down. Manzanita, I really need to tell you my experience. I love organic strawberries and I love to grow everything from seeds. Three years ago I bought strawberry seeds online because the ones I wanted were not on sale in the local stores. They grew into some interesting "blueberries", or so I thought. In fact these plants were poisonous. They were not blueberries either. A kind of sabotage. I never understood what happened. OMG How horrible. You all could have been poisoned. I'm sure you notified the company and I wonder what they said. I wonder how you get strawberry seeds? They must be the little black specks in the red part. I wonder if you dried the strawberry, you can use the seed. I have a huge book on "keeping seeds" so i'd better look it up. There is a seed club in town where they exchange their home grown seeds. I've always wanted to go but I've never made it there yet. Typical, huh? You must not have eaten them but that is scary. Thanks for the story and what can happen because i do order all my seeds online. Yes, I did report it and took pictures. That is terrifying if companies are pushing their GMO's on everyone. There are some really good organic seed companies online and of course, I've always trusted their seed. It never occured to me that competition could be that dirty. This town has the usual garden seeds in organic packets but the supply is always limited and for anything out of the ordinary, I, too, go online. Yes the strawberry seeds are on the outside, I've never thought of drying berries and planting them, but now I'm curious and may try it. I never thought about planting strawberry seed either. The seeds must be the things that crunch when you eat them. I still haven't looked it up. I have this huge wonderful book on saving seeds but I don't open it very often. I'm going to do just that when I get off the computer. I will look for these Alpine strawberries. Will they survive in Florida? When to plant them??? Can I find them online? I haven't planted strawberries because they take over the world, but it sounds like these do NOT. That was my reason exactly for at first thinking I'd say no, thanks to my neighbor but when she said, "no runners" I wanted to try them. I don't know if it's too hot in Fl but maybe they would need some filtered sunlight. 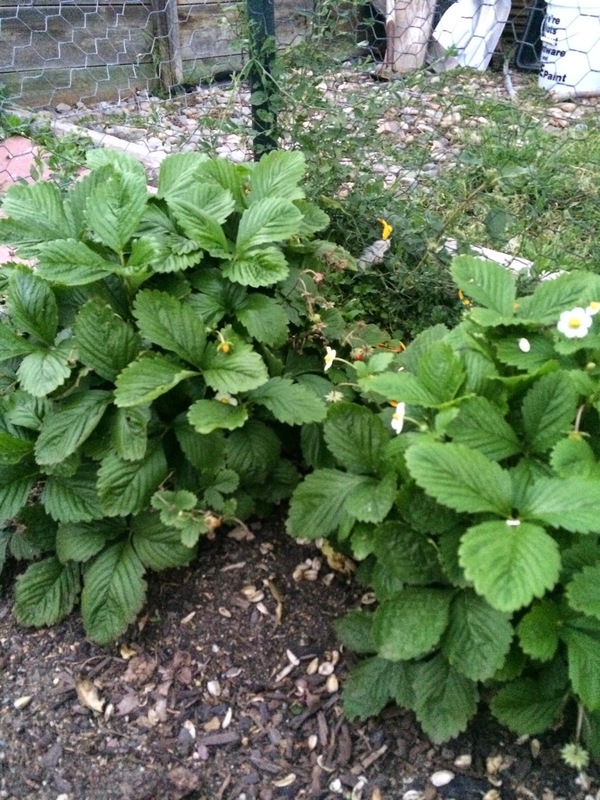 Here I just use a little mulch to keep them moist but evidently most strawberries survive the deep cold we have here. I bought a lot of hay bales to cover stuff for the winter. My sweet granddaughter who sings unloaded and carried them to be put around the chicken coop too. I can't even lift a hay bale anymore, but a lot of do get to weigh up to a hundred pounds. Ha. I bet you could find them online but as I said, my neighbor gave me some of hers and i had never heard of them before. There are some vids of them on YT too. In Florida I would suggest growing during your coolest months under shade like trees or shrubs. Find a place that has morning sun and afternoon shade. Some good advice.... your weather must be close to the same. I lived in Florida 25 years but never had a garden because I didn't like all the strange bugs and snakes one has to deal with. And we alwas came back to either Montana or Minnesota in the summer. Right you are, you're going to have to get yourself a little strawberry plant and if you don't have a good piece of ground you can plant these in big pots too. Look on YT, there are some vid of house berries in pots. Since the voles ate the roots of all my strawberry plants and my bed is gone, I will think about replacing them with Alpine when I figure out how to get rid of those beggars. That's a shame that the voles won't even allow you a garden. I saw some videos on YT where they are growing the Alpine berries in big posts. Since they don't send out runners and get to be a big round bush, they must work nicely in a container. Salivating at the very thought. I love strawberries - real strawberries that is - like yours. Not the muck they pass off as strawberries in the supermarket. Much like tomatoes these days actually. Don't get me going on that! Go ahead and "get going" on tomatoes. I'll even join you. There is nothing like growing your own food, esp. when you know you have organic seed and some natural soil without chemicals. I have to dehydrate a lot of the veggies for soups for the winter. I used to "can them" but I think the veggies hold their flavor better when dried. I've grown strawberries and they never made it to the table, as soon as ripe I pop them in my mouth, wonderful flavour. Even if one didn't like strawberries, they would love the Alpines. They are so sweet and melt in the mouth. ALPINE: noted. although I knew already they are a clumping type with tiny berries. I've often thought about growing some, but I'll have fierce competition from slugs and snails and birds. You are way ahead of me because I've never heard of Alpine berries. I've seen videos on Youtube of people growing them in containers. the last time I had strawberries were in December. We just don't get the right type here. It's way to sour! It's been a waaay long time since I've had strawberries. I had given up on them because the commercial ones all taste like cardboard. Even the so-called "organic" are often hard and tasteless. It's seems as if it's getting to the point that we have to raise our own food if we want the good taste and to be healthy. I tried to leave a comment on your blog but I don't know if it was accepted. I used to have a Wordpress blog and I think it still thinks I have it. Hi There, First (before I forget) --let me say how much I love your header... The reflections are amazing. Thanks. Isn't "point and shoot" great! I used to really be "into" photography and I had the great German cameras and my own darkroom. Now, today, my eyesight is way too poor for anything but the point and shoot or my iPhone. But they seem to capture the moment. Some stores have an organic source for produce and maybe you are one of the lucky customers. A neon strawberry plucker. What a precious memory and how fortunate for you to have this friend with such an "organic mom." Years ago we used to have a cabin in N/Minnesota on a lake called Duck Lake. (I wonder why everything in my life always connects to a duck?) It was a small lake and I've always been an early riser so I walked around the lake very early and picked strawberries along the way. By the time I got back to the cabin, everyone was up and we had these delicious wild berries on pancakes. Yum. I'm glad the reality of those berries lived up to the ones in your memories. My mouth is watering as I read that. When we visited our daughter in Switzerland, those Alpine strawberries grew everywhere, covering lawns, out in fields. When we walked along the front lawns where the strawberries crept through the fences, I picked as many as I could reach. Power bursts in a tiny bite! Lucky you! I didn't know your daughter had lived in Switzerland and what a fun visit that must have been. The setting sounds like something out of a fairy tale. I can picture the Swiss scene, the wild berries and tall snow capped mountains. Yay, power bursts. Well stated. Double big bummer. Perhaps they need a wee shot of phosphorus.Also check the ph because berres need soil that is more on the acid side. When I was younger, we used to go wild strawberry picking. One day my sister and I had our kids with us picking strawberries. Her young son went to pick a berry and a small snake grabbed his finger. He said Mom... LOOK!! He thought it was cool. Here the snack was digesting his finger into it's digestive tract. Anyway, she pulled it off and we kept on picking. That's a great way to raise kids and acquaint them with nature. Kids are so accepting of things like snakes, etc. if the parent doesn't make a fuss about it. I like that story. I remember when I was in school, hydroponics was just kinda becoming popular. That was 60 years ago. We were all pretty fascinated with it. Enjoyed our talk this morning. Strawberries were the first thing I taught my daughters to raise when they were old enough to begin gardening. Sweet wonderful times. Lucky girls to know gardening when they are grown. I am sure they have thanked you many times. Dear Manzanita, I remember those strawberries also. AND....I so remember the Bergman movie. There was a scene in it were the two young lovers were wandering, homeless, and they found strawberries in a field and milked a cow and dipped the strawberries in the cream. The photography was so vivid; the color so deep that it imprinted itself on my mind all these years later. Peace. I remember strawberries every April when Poteet, Texas the strawberry capital of Texas has their festival. Did you know Poteet is the birthplace of George Strait?